Jake Giddings in action in Belgium. Jake Giddings helped JWBird Motorsport maintain their uninterrupted run of points-scoring results during round five of the Avon Tyres British GT Championship at Spa-Francorchamps at the weekend (July 11) but the 20 year-old from Wisbech was ultimately disappointed with ninth position in the GT4 class. 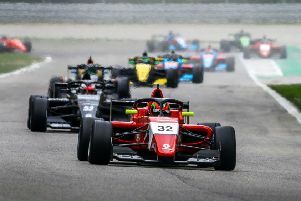 On a less than straightforward weekend in Belgium, Giddings and team-mate Kieran Griffin encountered difficulties in practice and the two-hour race itself with power issues hindering their ultimate potential. While pleased to at least take away some points from a challenging encounter, Giddings – who was a race winner at Spa in the corresponding event last year – knew much more was possible for the JWBird entry during the championship’s annual overseas visit. “It wasn’t the best weekend”, reflected the Aston Martin Evolution Academy driver. “We picked up a problem in free practice which led to a change of fuel pump but in the race the problem came back again. Late on we lost pace and were really struggling. Spa is an ideal track for the Aston normally, so it’s disappointing we couldn’t come away with the sort of result we should have had. Lapping 11th fastest in GT4 in his qualifying session, Giddings produced a best time of 2mins 37.265secs around the heavily congested track while Griffin was 12th quickest in his run, with a best lap of 2:45.043 – equating to 13th on the GT4 grid on combined times. Griffin took the opening stint of Saturday’s two-hour race and after slipping to 15th position he remained there for the first eight laps before moving up one place. Following a safety car period between laps 14 and 16, the JWBird driver held an improved 12th position and when the safety car re-appeared almost immediately after the re-start Griffin was up inside the top eight. With the second cautionary period lasting several laps and passing the 50-minute mark which signalled the opening of the pit-stop window for driver changes, the vast majority of the grid opted to serve their mandatory stops at that point with Giddings taking over the No.47 Aston Martin V8 Vantage. Rejoining the race in ninth position in GT4, the Finesse Paving & Civil Engineering, Cowley Road Garage and Toppesfield-supported driver was determined to make progress but a recurrence of the loss of power which first struck in testing prevented any gains. Instead working hard to hold station to the finish at the two-hour mark, ninth position keeps the team-mates in the GT4 championship top 10, less than 10 points shy of the top six, and sixth in the Pro-Am classification. In the team standings JWBird Motorsport is in eighth place. Round six of the Avon Tyres British GT Championship will take place three weeks from now, over the weekend 1st/2nd August, at Brands Hatch Grand Prix Circuit in Kent.